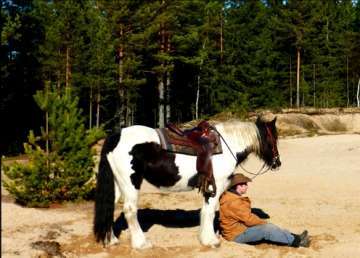 Chento is Marcia's first horse and is crossbreed NRPS, New Forest/Pinto. Marcia brought Chento when he was 2,5years old and tought him everything, as she also learnt from him as well. 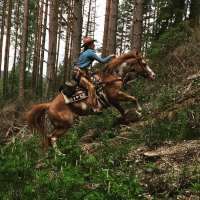 They became best friends in a couple of years and rode togeather in several competitions like jumping, military, short distance races and they followed western lessons. He is brown/white pinto horse, 1.50 in height and has a sensible character; he needs a little while to get to know you but after that he will do anything for you! Chento is the leader of our herd. 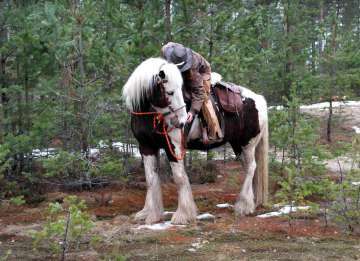 Stech is Dimitry's first horse and is a black & white Gypsy Vanner Horse. She is 1.52 in height, has a good character and is a multi purpose horse! 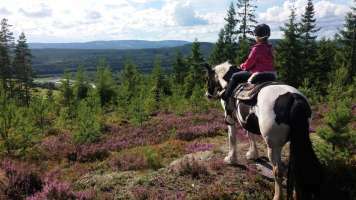 She takes small children and the most scared grown ups with her into the forests and shows them that horseback riding is great fun! She is very steady and we use her when we discover new tracks in the forest. Stech is used to wearing a harness and we use her to pull both our wagon and sled. She also pulls people on skies or snowboard! Peewee is an Overo Red Dun Paint and came to our Farm third in row. 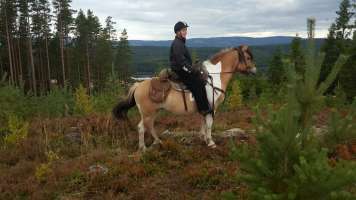 He is ridden by Marcia as the leaders horse. 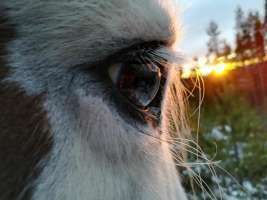 Peewee is a real `peoples`-horse and quickly comes to you from our paddock or meadow to get a hug. 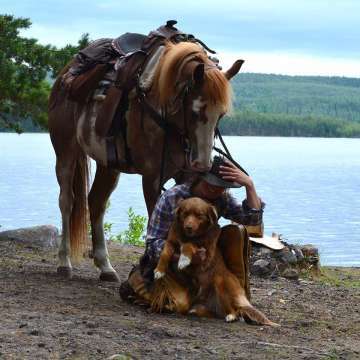 He is willing to work, eager to learn and loves to go out for a ride! Jaymila was our fourth horse. 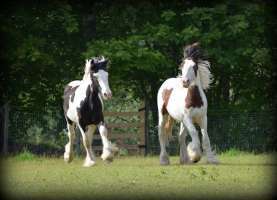 She is 75% Fjord and 25% Gypsy Vanner Horse; 1,42 in height and Buckskinn multi-coloured. Jaymila is suitable to carry children as well as grown ups. 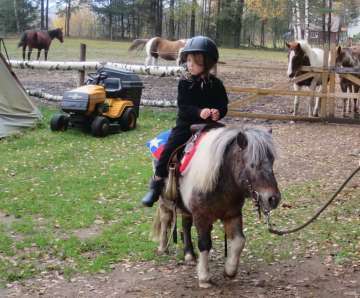 She is not very big but extremely strong; a beautiful and compact pony. She as well is a real 'hug-loving-pony'! Luna ( one of our Gypsy Horses ) came together with Moyra in October 2015. 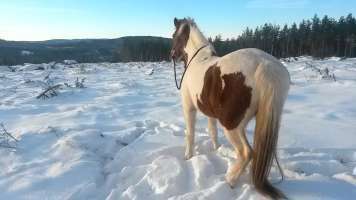 She is a rubust and a strong build brown-white tinkermare. She is very kind and hardwilling to work, when you’re in her surrounding she will surely come to get a hug. She loves to go outside for a trail or wear a harness and we use her to pull both our wagon and sled, she will always work hard for you. In the wintertime she also pulls people on skies or snowboard! Luna got a beautiful foal named Gringo (brown-white-black) with blue eyes who borns in August 2016. 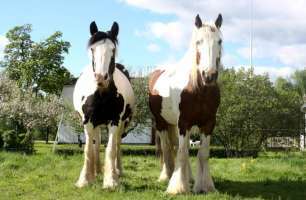 Moyra (one of our Gypsy Horses ) came together with Luna in October 2015. 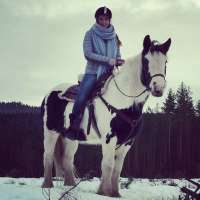 She is a luxe black-white Tinkermare, 1.60 in height, she is strong but luxe build. Moyra is relaxed, gentle of character en wellwilling to work. 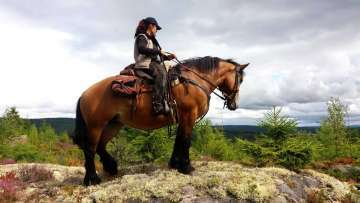 She is doing trails, short up to multiday trails, also she can go in harness and work on the fields or pull the chuckwagon. 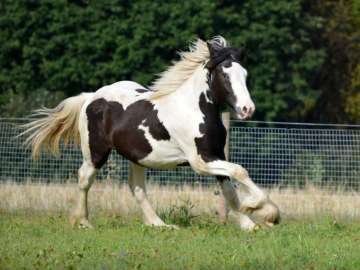 She get in July 2016 a beautiful black-white foal named Charro. In March 2016 came Holly to the Farm. 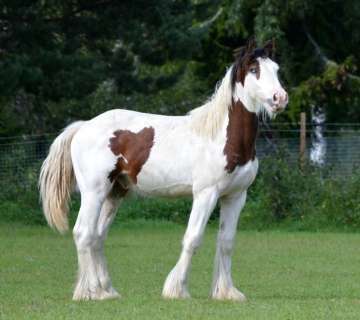 A nice, rubust Ardenner Mare. Holly pulls the chuckwagon, works on the fields where she pulls vintage culture machines. She helps also in the forests to take out our trees. Docs and Docsy came to us in May 2016. 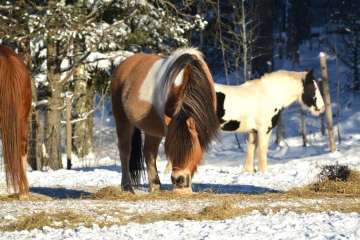 They both where used in Western sport in the Netherlands, Reining and Cutting. Now they joines the trails outside.. 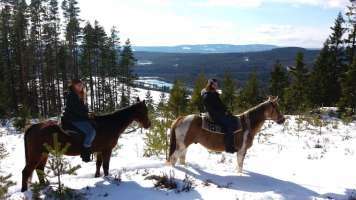 They are both really good for the ones who love to try our barebackriding lessons..
All riders, from young up to adults will learn from them! With very light helps they will do it for you! Pierro is our miniture stallion and Marcia owns him since he was a foal. 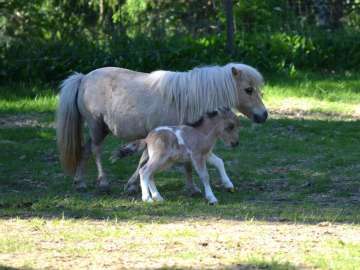 It is a mini shetlander and his colour is pintaloosa. He is 0.95 in height. He as well lives in the pack and sometimes he even thinks he is the biggest of the herd! Pierro is a real charmer and once in a while he gets a visit from a mini mare for breeding. Her colour is Palomino and she is approx. 0,83 in height. She has already given birth to one of Pierro's foals once. Bodi is a foal from Pierro and Polly and is born at the Farm in June 2016. She is a real small bandit, at the same time the mascotte of the Farm! She stays at the Farm. 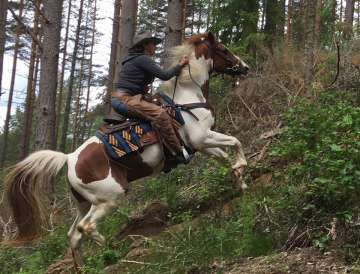 Charro stayes also at the Farm where he will get all the training he needs to join the multiday trails, short tours, working on the fields, pull a wagon. Maybe he will be a nice stallion in the future for some mares.. he is beautiful build, has a nice colour and brilliant character! Gringo stays at the Farm, he will be trained for the future. Marcia and Dimitry want to make an allround horse from him. He has to learn for trailriding but to go in harness and pull a wagon with tourists or to work on the fields on the new Farm.